For the first time in history, U.S. casino-goers can enjoy a slate of casino games to the full extent of the Caesars brand from the comfort of their home. This fact cannot be overstated as, indeed, CaesarsCasino.com delivers a truly remarkable product in this first ever home edition of an online casino. Having the huge Caesars brand behind this offering means, of course, highest quality in every aspect of the whole experience: from an impeccable selection of games that caters to every whim, to exquisite interface, to player-oriented and generous rewards program, to state of the art customer service. Games are offered in five categories: Slots, Blackjack, Roulette, Table Games, and Video Poker. 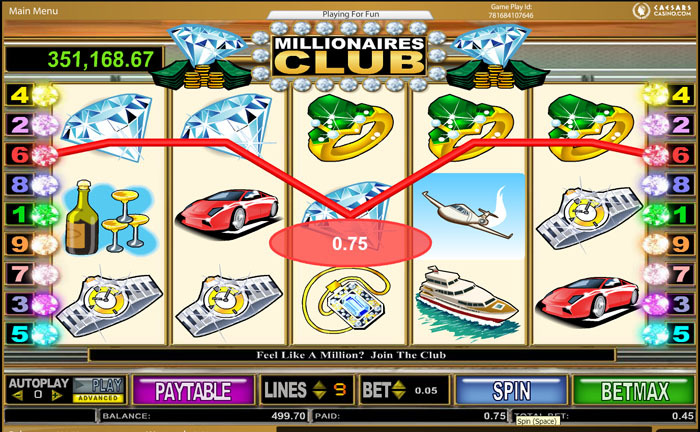 Each category has at least several different types of games, but in the case of Slots – several dozen of them. Slots also have five progressive jackpots, where a player can score a huge, in six digits, payday by hitting the right combination. Interface is implemented at the level nothing short of overwhelming. Elegant design, right combination of colors, purposeful visual effects, and easy navigation make for an uncomparable playing experience. Player rewards program, called Total Rewards, is very well thought out and designed to provide immediate rewards for playing volumes as well as to generously compensate player’s loyalty. 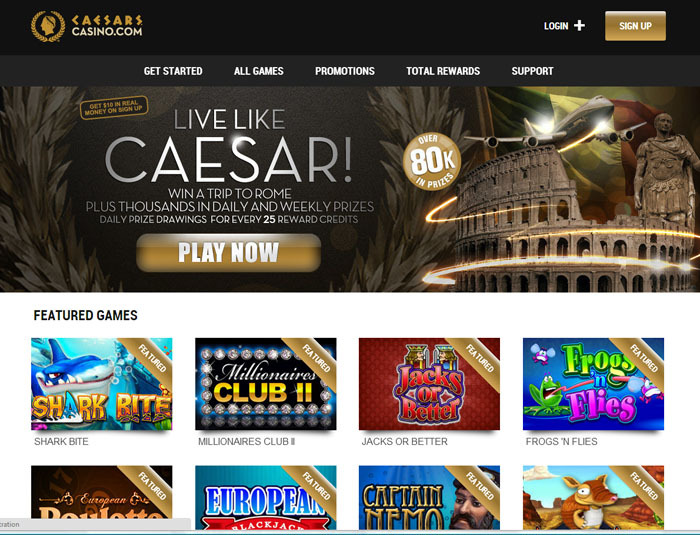 It features many possible ways to accumulate and redeem player points; moreover, the online play also counts towards the offline member account that can be enjoyed at any of over forty Caesars brick-and-mortar properties. Customer service is available around the clock and is instantly accessible via live chat, phone or email. In addition to that, casino’s main page has a comprehensive support section with complete information on a lot of the issues that a player can potentially experience. Last, but certainly not least, those fortunate ones living within New Jersey borders can get to play in the casino in real money games without having to deposit a penny of their own: just by signing up the site offers a $10 bonus to all eligible players – no deposit required. When it comes to the interface, the word is “easy”. Easy on the eye and easy on your fingers. Designed with extreme attention to detail, it will satisfy the most demanding of tastes. The software is completely web-based and all the action is taking place in your browser window. Just type in the URL to get to the main page, which will give you an easy access – in one or two clicks – to your game of choice. 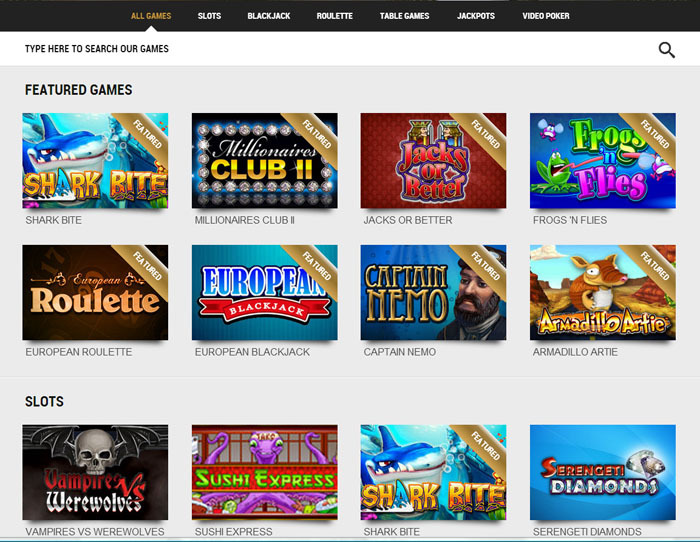 If your game is not already under the featured games list, you can get to it by clicking on All Games and find it among the five categories under it: Slots, Blackjack, Roulette, Table Games, or Video Poker. A click on the desired game button will load a separate window with the game interface. With an example of Double Double Bonus video poker below, you can see that the screen layout is extremely intuitive and the graphics are crisp and visually appealing. These principles of convenience, purpose, and enjoyment are behind the design of all of Caesars’ casino games. 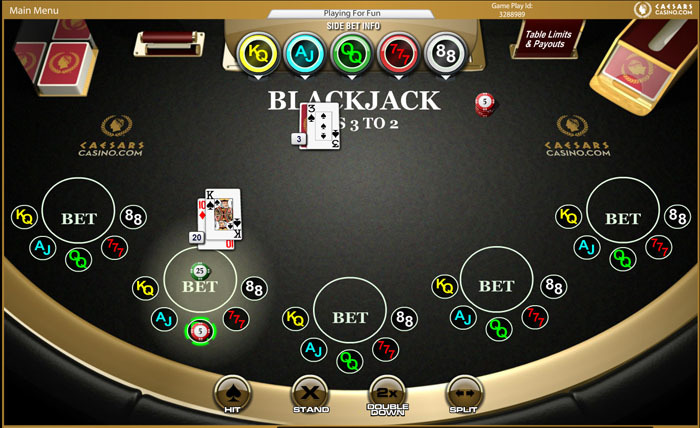 At table games, audio feed accompanies the play to announce all the action for extra convenience. All in all, the software is a full step ahead of its peers and deserves the highest marks. Caesars offers an amazing variety of games across five game categories: Slots, Blackjack, Roulette, Table Games, and Video Poker. Slots are represented by three dozen different types each with its own characteristic theme: from tranquil ones like tropical, cartoons, and fruits to more adventurous ones, such as samurai, pirates, and even vampires. There are several types of blackjack, and the palette is, again, very impressive: Vegas, Sidebet, and Micro-limit variations – just to name a few. There are two different types of roulette: standard and European. Standard represents the traditional 37 number roulette wheel, while European may suite the well-travelled types a little better as it’s rendered in the Old World style with labels in French and additional betting options. The Table Games category features Triple Action Poker, where, besides ante and bet, there are additional wagering options: you can bet for payouts from the rank of your winning hand or if the flop has a made hand in it. Baccarat is another game in this category. Video poker comes in several variations: Tens-or-Better, Jacks-or-Better, Double Double Bonus and others. A nice little addition is the double up feature where all you need to double your winnings for a hand is to guess the color of a hidden card, which comes, of course, at the fairest of the odds: 50-50. That means you can double up as many times as you want without sacrificing any EV. Several deposit options are at your disposal to begin wagering at Caesars Casino online. You may deposit by credit card, bank – or ACH – transfer or by going directly to “The Cage” – the cashier at the brick-and-mortar Caesars Palace casino in Atlantic City. Please note that, to deposit with a credit card, your card issuer needs to allow gambling transactions. It is recommended that you check with your card-issuing bank before attempting this type of deposit. Withdrawals are possible either by bank transfer (ACH) or USPS check. Again, there is a direct option of going to the Caesars’ Atlantic City property and receiving your money at the cage. There is no stated minimum on the deposit, but keep in mind that, some credit cards may charge fees for deposits. The minimum on remote withdrawals is $20, no minimum exists for withdrawals at the cage. Caesars Casino currently offers a $10 no deposit bonus for all newly registered players from New Jersey. Yes, the Caesars Casino bonus is 100% completely free money, no deposit required! The bonus will be deposited into your account within 72 hours from registration. Note that, while registering, you do not need to deposit any money or use a Caesars Casino bonus code to be eligible for this bonus. Yes, it’s completely free – no strings! This money can be used only for wagering and cannot be used for table games. According to the terms, you can keep all the winnings derived from this bonus so, good luck! Caesars’ support is there to assist you 24 hours a day, seven days a week. You can choose to have a live chat with a representative, send an email, or make a phone call in the event you are having any issues with the site or have any questions. 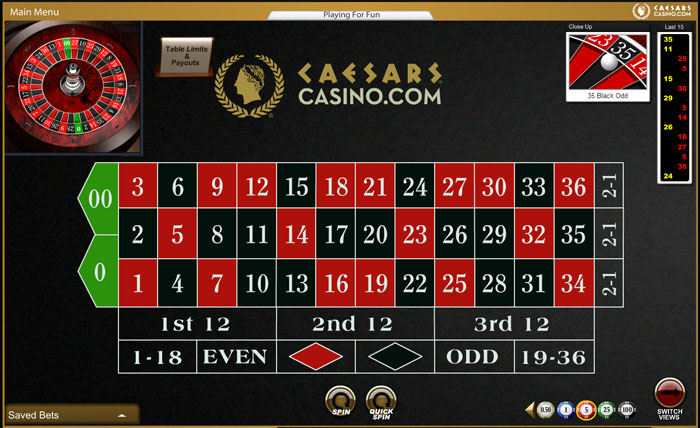 There is also Support tab prominently displayed on their main page at www.caesarscasino.com/en, which will give you access to a long list of Frequently Asked Questions, conveniently placed there in anticipation of any user inquiries.